With an amazing cast, this is a story of four women coming to terms with who they are in Certain Women. One of America’s foremost filmmakers, Kelly Reichardt directs a remarkable ensemble cast led by Michelle Williams, Kristen Stewart, and Laura Dern in this stirring look at three women striving to forge their own paths amidst the wide-open plains of the American Northwest: a lawyer who finds herself contending with both office sexism and a hostage situation; a wife and mother whose determination to build her dream home puts her at odds with the men in her life; and a young law student who forms an ambiguous bond with a lonely ranch hand. As their stories intersect in subtle but powerful ways, a portrait emerges of flawed, but strong-willed individuals in the process of defining themselves. 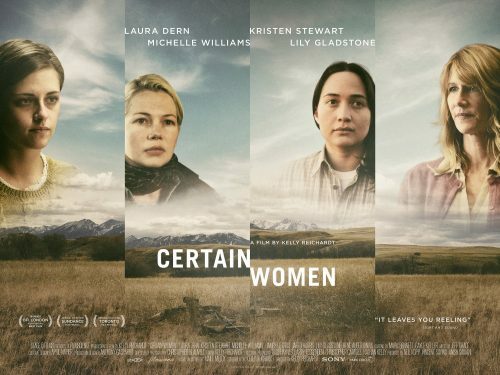 Find out more of twitter via #certainwomen.